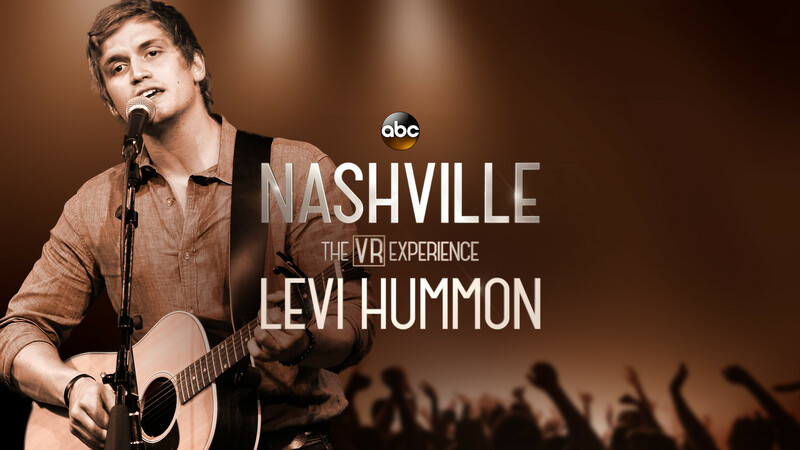 Levi Hummon "Life's For Living"
Beginning today, fans are invited to join the stars of ABC's acclaimed primetime series "Nashville" in series of virtual reality experiences set at the iconic Bluebird Café, one of country music's most storied listening rooms. Part of its ongoing "On the Record" digital series, ABC shot three "In The Round' musical performances with cast and singer/songwriters from the show, as well as a performance scene from the show featuring Layla (Aubrey Peeples) and Avery (Jonathan Jackson) in the middle of a very telling moment. The experience can be accessed on ABC.com/VR, and via Littlstar's app for headsets, mobile, Apple TV and the web. "If music is the heart of our show then the Bluebird Café is its soul," said Dawn Soler, senior vice president of music at ABC Television. "Its signature "In The Round" format is what makes it so unique. Singer/songwriters pull up chairs and perform in a circle in the middle of the café. They play, sing, tell stories, and basically just have fun with the music, the audience and with each other. With this VR experience, fans will literally be at the center of it all. It's a perfect format for virtual reality and a natural extension of 'On The Record.'" "As storytellers, we strive to create a world rich with characters and stories that fans will want to completely loose themselves in," said Chris Thomes, vice president, Digital Media Studios, Disney|ABC Television Group. "Nashville fans love the music and with VR, we can bring that world to life for them in way that is completely authentic and immersive." May 11 - Features performances by Charles Esten, singing "Let's Do This Thing," as well as a duet with Jaida Dreyer on "This Town." Jonathan Jackson offers a special performance of "Alleluia" and Lennon & Maisy Stella share "A Life That's Good." May 18 - Features Chris Carmack's "Pieces of You;" Sam Palladio shares his personal hit "Wake Me up in Nashville" and joins K.S. Rhoads for "Battles." Levi Hummon caps the performances with "Life's For Living." May 18 - Full performance scene from that night's episode of "Nashville," featuring Layla (Aubrey Peoples), Avery (Jonathan Jackson), Bucky (David Alford) and Glenn (Ed Amatrudo). May 25 - Features Clare Bowen and Brandon Robert Young singing "It's Not Yours To Throw Away," Sarah Siskind sings "Keep me Alive" before joining Aubrey Peeples on "Too Far From You" and Erin McCarley and K.S. Rhoads perform their heartbreaking song, "I Will Never Let You Know." "Nashville" airs WEDNESDAYS (10:00-11:00 p.m., ET) on the ABC Television Network. Full episodes are available the day after they air on ABC.com and the WATCH ABC app. News Clare Bowen & Brandon Robert Young "It Ain't Yours To Throw Away"
News Erin McCarley & K.S. Rhoads "I Will Never Let You Know"
News Aubrey Peeples & Sarah Siskind "Too Far From You"